Mahindra Trucks and Buses are known for their strong product development, a robust product development team and modern plants with the best equipments which make them the third leading player in the industry. Mr. Manoj Kumar Sahu, MD of Ganpati Carrying Corporation Ltd. Mumbai shares similar views about Mahindra Trucks and Buses. 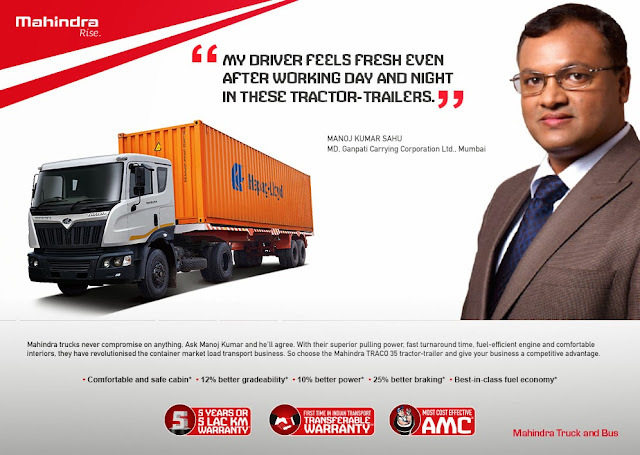 To quote Mr. Sahu, “my driver feels fresh even after working day and night in these tractor-trailers.” Mahindra Trucks work relentlessly when it comes to delivering the best to their customers. The customers are left feeling happy and satisfied with their choice of choosing Mahindra trucks over the automobile companies. Their vision and mission both work hand in hand in delivering the finest outputs. The drivers of these tractor-trailers are given prime importance and hence he says that Mahindra’s tractor-trailers offer comfortable and safe cabins for the drivers along with 12% better grade ability, 10% better power, 25% better breaking and the best-in-class fuel economy. Mahindra also offers exclusive deals like 5 years or 5 Lac KM Warranty along with a transferable warranty; which is a first time in the Indian transport industry, giving them an edge over the other companies.